Planning a new product launch on social media can be challenging, but it is also a great platform to attract new followers, build product awareness, and most importantly, convert your engaged audience into purchasing customers! In October 2018, BioHealth Pte Ltd from Hongkong launched its range of premium, next generation hair growth therapy – TRICHODERM® BlackSeries – in Singapore. Powered by the TricoCell™ Deep-Seated Self Regeneration Technology, the anti hair loss product helps increase hair density while reducing hair loss and stimulating new hair growth. Trusted by many Hong Kong’s TOP beauty bloggers, the shampoo and leave-on serum duo was introduced in Guardian’s major outlets and on Guardian’s E-Commerce website. Hashmeta was engaged as the social media agency of BioHealth Plus Ltd, to strategise and lead the execution of TRICHODERM®BlackSeries’ launch in Singapore. We brought in the expertise of our social media strategists and our in-depth knowledge of the local beauty and wellness industry. We defined our target audience and created two distinct personas – Office Oliver and Mummy Mandy. We brainstormed about their demographic and characteristics of these two personas and the hair challenges that they had faced. With an enhanced knowledge of our product’s target audience, it was easier for us to create a social media marketing plan to achieve our key objectives. This gave us a clearer direction to determine the type of social media platforms and digital content formats to use. Characteristics Enjoys taking care of his well-being and is on the look-out for beauty and wellness solutions that works for him. He values product/technical innovations, but only if they provide a true benefit, improve his well-being and quality of life without any extra effort. Faced with the body changes that are brought about by childbirth, she feels less confident. She’s constantly looking out for solutions that are both effective and safe. She will heed advice from fellow mummies on social media – be it close peers or public figures. The beauty industry has adopted the use of influencer marketing more fervently than any other industry. Influencer marketing has undoubtedly become one of the most rewarding marketing methods used today. According to a Tomoson study cited by Forbes, “for every dollar a brand spent on influencer marketing, it made $6.50”. In Singapore, this form of online word-of-mouth marketing has also become increasingly important to brands as local consumers are more digitally-dependent on information and will make purchases that are based on recommendations found on social media. In fact, 85% of Singaporeans are active social media users on the go, almost doubling the global average of 45%. Our target audience – Office Oliver and Mummy Mandy – are both active users on social media; following their favourite brands and personalities on Facebook and Instagram. Turning away from traditional TV, radio and print, social media becomes the main channel for our target audience to consume content. 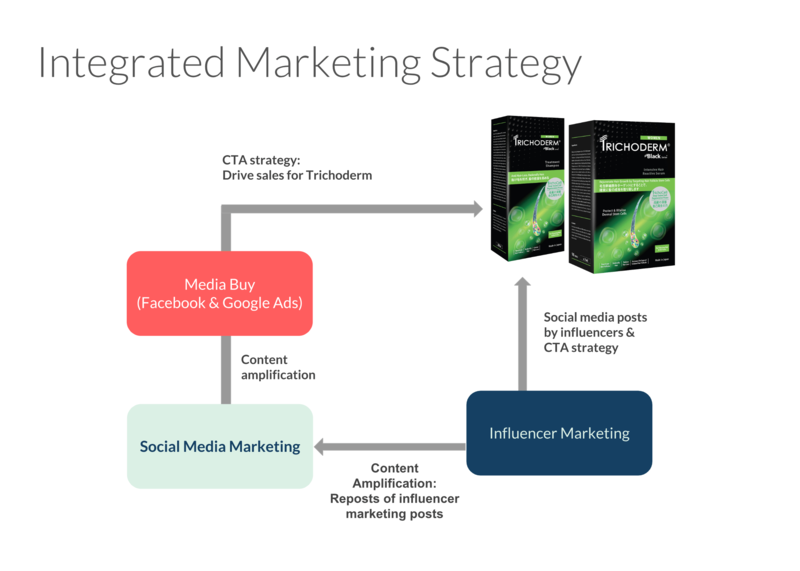 This opens an opportunity for TRICHODERM®BlackSeries to tap into the limitless landscape of social media and reach out to our relevant audiences through relevant influencers. Besides harnessing the reach of relevant influencers, we also proposed to re-distribute valuable content that were created by the influencers, and publish them on the brand’s social media pages – Facebook and Instagram. These content could then be further amplified through the use of media buy to drive traffic to the Guardian E-Commerce Website. There has been an explosion of growth in video content on social media in recent years. Around 100 million hours of video are watched every day on Facebook. In Singapore, internet users watch an average of 2 hours of online videos per day. Hence, we proposed to combine the two hottest trends of social media marketing — video content and influencers. Over the 3-month social media launch campaign, we engaged a mix of Mega, Macro and Micro influencers. This allowed us to have multiple touch points to reach out to our audience, and in turn, maximising the exposure of the product launch on social media. We partnered with Mega and Macro influencer in a live stream collaboration. We leveraged on their strong social media following to run Facebook/Instagram LIVE videos. These LIVE videos enable viewers to engage with the influencers and the brand on a new level on social media. Many active viewers asked questions about the products and received live responses from the influencers. This interactive content format gave our target audience an authentic and personable experience with the brand. On the other hand, we engaged Micro influencers to share about their usage experience with TRICHODERM®BlackSeries via short 60-sec Instagram videos. These micro-influencers were selected based on the relevance of their profiles on social media in relation to the brand and our target audience. We also identified a group of mummy or mum-to-be influencers to speak to profiles like Mummy Mandy. Other consideration factors in the selection process were potential reach on social media (no. of followers) and estimated performance (no. of likes and comments). These video content that were created by the influencers were well-received with high video views and interactions. They were effective in building awareness of the products among our target audience. However, our social media launch campaign has to achieve our second key objective as well — sales. We needed to convert these video views into potential leads and ultimately, sales. Hence, we proposed to re-distribute these video content on Trichoderm’s social media pages using ads. The video content were edited into bite-sized clips by our in-house creative team. These compilation clips were shared on the brand’s social media pages as clickable link posts with Call-to-Actions (CTA) buttons. We also created a series of static link posts. By clicking onto these link posts, social media users will be directed to TRICHODERM®BlackSeries landing page on the Guardian E-Commerce Website for conversion. Media buy was used to promote these link posts. Depending on the content of the post, we targeted these social media ads at the relevant audience – either Office Oliver or Mummy Mandy, using their demographics, interests and behaviours. We also adopted the remarketing strategy where these CTA ads were targeted at social media users who have watched at least one of the influencers’ LIVE videos or our bite-sized compilation clips. These social media remarketing ads were cost-effective due to brand familiarity. Over the 3-month launch campaign, we have built partnerships with over 20 influencers and created multiple valuable assets for the brand. These valuable assets were re-used in the brand’s print collateral, website banners and other marketing channels. They were put into good use on social media as well. With clear CTAs, all our social media posts were aimed to direct potential consumers to the brand’s landing page on Guardian’s E-commerce website and ultimately, checkout their shopping carts. Over the 3-month period, we clocked a total of 18,000+ link clicks to the brand’s landing page via social media. Moreover, we received positive feedback from the client that products were not only selling fast on the E-commerce website but also off the shelves in major Guardian stores in town. However, we all know a launch campaign is only the start of the marketing journey, not the end goal. We have to constantly innovate and improve on our social media marketing strategies to acquire new customers. There are many other digital platforms that can be utilised such as YouTube marketing, streaming podcasts and collaboration with relevant media publishers. It is also crucial to retain customers for the brand through retention strategies like personalised EDMs and the building of social media communities. After all, a long-term customer is always more valuable than a single-deal customer, especially a HAIR-ppy one.